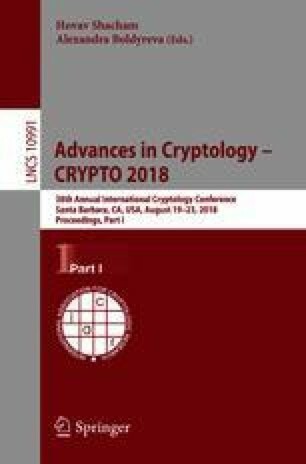 We study Authenticated Encryption with Associated Data (AEAD) from the viewpoint of composition in arbitrary (single-stage) environments. We use the indifferentiability framework to formalize the intuition that a “good” AEAD scheme should have random ciphertexts subject to decryptability. Within this framework, we can then apply the indifferentiability composition theorem to show that such schemes offer extra safeguards wherever the relevant security properties are not known, or cannot be predicted in advance, as in general-purpose crypto libraries and standards. We show, on the negative side, that generic composition (in many of its configurations) and well-known classical and recent schemes fail to achieve indifferentiability. On the positive side, we give a provably indifferentiable Feistel-based construction, which reduces the round complexity from at least 6, needed for blockciphers, to only 3 for encryption. This result is not too far off the theoretical optimum as we give a lower bound that rules out the indifferentiability of any construction with less than 2 rounds. The authors would like to thank Phillip Rogaway, Martijn Stam, and Stefano Tessaro for their comments. Barbosa was supported in part by Project NORTE-01-0145-FEDER-000020, financed by the North Portugal Regional Operational Programme (NORTE 2020) under the PORTUGAL 2020 Partnership Agreement, and through the European Regional Development Fund (ERDF). Farshim was supported in part by the European Research Council under the European Community’s Seventh Framework Programme (FP7/2007-2013 Grant Agreement no. 339563 - CryptoCloud). This work was initiated during a short-term scientific mission sponsored by the COST CryptoAction (IC1306).